Inspired by Mark Burnett – an IT security analyst who first championed the idea of a “password day,” in his book’ Perfect Passwords’ – Intel Security took the initiative in 2013 to declare the first Thursday in May each year, as World Password Day. With useful tips about passwords and advice about what you should and shouldn’t do with them, the site also includes a password practice tool that rates your password for you, an animated illustration on how to create a strong password and – password blaster – an interactive game where you can destroy the world’s worst password, one keystroke at a time. Interestingly, the site also addresses the bug-bear of password security – password frustration – and the difficulties encountered in remembering several passwords, strong passwords and the reliance on the use of one password, as the last recourse to protecting your accounts. The trick according to Intel is not to remember and not to memorize your passwords at all but to use a password manager. For the unfamiliar, a password manager is a program that creates, remembers, and enters your passwords for you and removes the potential risks attached to accurately memorizing passwords for multiple accounts. It also offers the added advantage of improved account security as well as the peace of mind that comes with knowing that your accounts are well protected. While password strength is key to security, Intel have not forgotten about Two-Factor Authentication (2FA) and strongly suggest employing 2FA, particularly in relation to your most sensitive accounts. For more information about passwords, account security and the reasons why you should use 2FA, you can check out our infographic here. With all of these compelling incentives, it’s almost impossible not to devote some time to strengthening your passwords. Support World Password Day by taking the pledge to take passwords to the next level by sharing the password tips below on social media, changing an old password to a new one or consider using Two-Factor Authentication (2FA) for your important accounts. 6. Lock your mobile with a PIN or password. 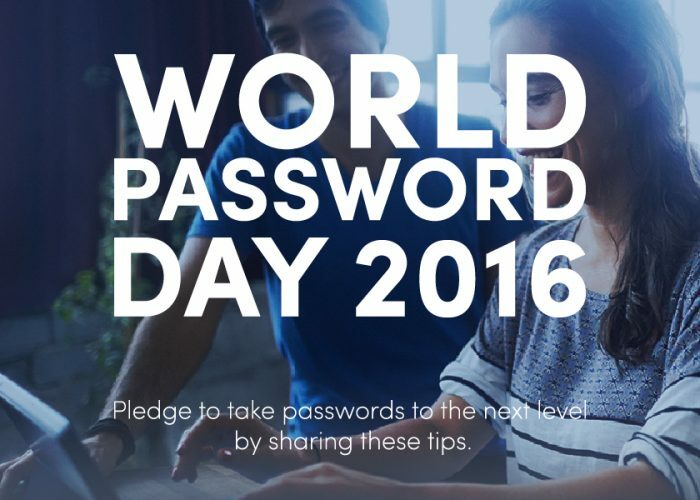 For more information, you can check also out World Password Day here.